Banksia cunninghamii Sieber ex Rchb. Description: Shrub to 5 m high, lignotuber absent, multi- or single-stemmed at base; bark smooth, becoming tessellated; branchlets usually hirsute. 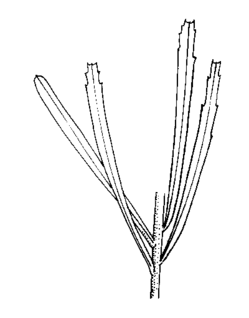 Leaves alternate, scattered, linear to ± oblanceolate, 2–7 cm long, 2–5 mm wide, apex mucronate, base attenuate, margins recurved to revolute, adult leaves mostly entire except for a few teeth towards apex, jevenile leaves strongly toothed; lower surface tomentose, lateral venation obscure; petiole 1–3 mm long. Conflorescences 6–15 cm long. Perianth 20–30 mm long, yellow or golden, persistent. Style hooked below apex, yellow throughout or dark red to purple-black in upper part, falling within a year. Follicles up to 100, very crowded, 10–24 mm long, opening either with fire or spontaneously. Distribution and occurrence: Grows in dry sclerophyll forest and woodland, chiefly on the coastal ranges.